Very important, please read the latest in Washington's latest attempt to take away Private Property Rights. Big Green has an unlikely new sales pitch to convince Congress to fund ever-expanding land grabs by the National Park Service -- save wildlife migration. A map overlay showing all the U.S. wildlife migration paths would blot out nearly half the nation -- a very clever diagram for empire-building bureaucrats. 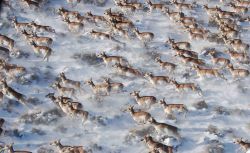 The obscure but well-heeled Wildlife Conservation Society (2010 assets $764 million) unveiled the idea last week in "Spectacular Migrations in the Western U.S.," a 45-page report on the purportedly urgent need for a widespread network of wildlife migration corridors to avert countless extinctions. The WCS is a consortium of zoos ("urban wildlife parks") and global conservation programs that uses science, according to its mission statement, to "change attitudes towards nature." Its Spectacular Migrations report looks suspiciously like the expansion agenda of Interior Secretary Ken Salazar, the NPS's boss. There's a good reason: WCS staff recently conducted a migration workshop for the NPS, which produced a new framework for conserving migrations in or near national parks. The Hewlett Foundation has already funded demonstration corridors using the NPS framework in the U.S. Southwest and Mexico. 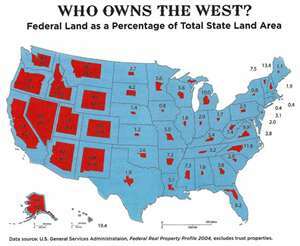 Labels: Agenda 21, Hunting Rights, Migrations patterns, Private Property Rights, Spectacular Migrations in Western U.S.